Laura Ingalls Wilders books are part fiction, but present many events and characters from her own life. 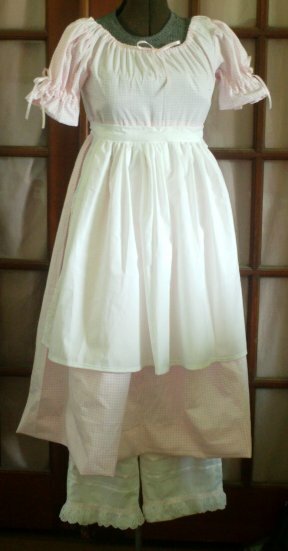 #C217 Ensemble includes simple printed calico dress with short puffed sleeves and trimmed hem, white muslin sleeved petticoat with gathered neckline, white muslin trimmed pantaloons, white muslin apron and coordinating bonnet. 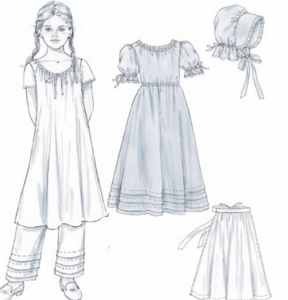 #A217 Ensemble includes simple printed calico dress with short puffed sleeves and trimmed hem, white muslin sleeved petticoat with gathered neckline, white muslin trimmed pantaloons, white muslin apron and coordinating bonnet.